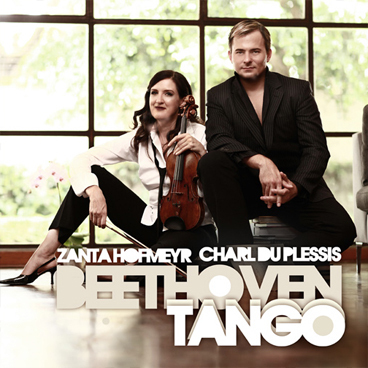 The first collaboration of Steinway Artist Charl du Plessis and violinist Zanta Hofmeyr has just been released on CD. Beethoven Tango is this duo’s first recording project after sold-out performances all across South Africa. Beethoven Tango (as the name suggests) is a unique musical journey joining the fire of tango rhythms with the sounds of Sting and Beethoven. The result is a refined stylistic interpretation of well-known works, utilising the energy of fresh, new arrangements by Charl du Plessis. Beethoven Tango appeals to an inquisitive musical palate and combines the refined qualities of Zanta Hofmeyr’s classical technique with the improvisatory magic of contemporary piano. Tracks include hits like An Englishman in New York, Fragile, Libertango, Fields of Gold and Errol Garner’s Misty amongst others. Zanta Hofmeyr needs no introduction as she has already established herself as one of SA’s finest violinists. She makes regular appearances as soloist and chamber musician around the country and has recorded 3 CDs.